Photos by Dean Buscher/The CW. The team is split to handle a number of different issues in this week’s Legends of Tomorrow. While supporting Nate at his father’s funeral, Ray is visited by Nora who tells him that she didn’t kill Hank. Mona and Charlie alert the team that a magical disturbance in 1802 England has endangered Jane Austen’s literary career. Sara and Zari join the pair in the hunt for the next fugitive. Meanwhile, Mick and Constantine stay at the funeral, where Hank’s spirit is trying to get Nate’s attention. The ladies learn that people have been acting strangely since Lord Remington arrived in town, including a wedding that descends into an orgiastic display. The culprit, however, is not the elderly noble, but his coachman Kamadeva, the Hindu god of love. Zari catches the fugitive, who blows his love dust into the air, fueling the Legend’s passions. Unable to decipher her feelings for Nate, Zari decides to drop her reserved exterior and experience the unbridled release the love god has to offer. For Ray and Nora, the love dust means the two finally relax in each other’s company and share their feelings. Sara and Charlie each experience sexual dreams. Mona, however, is shook by her dream. Nothing will bring Konane back. After an argument with Zari, Mona transforms into “Wolfie” and hunts down Jane Austen. Austen previously told Mona that she doesn’t believe in romantic love. When Wolfie confronts Austen, Jane reveals that she is a romantic at heart, but that has doomed her to a life of poverty once her father dies. She turned aside what would have been a financially sound marriage proposal because she believes that people should enter into a relationship for love. Austen explains to Mona that means not losing control, which snaps Mona back to her human form. 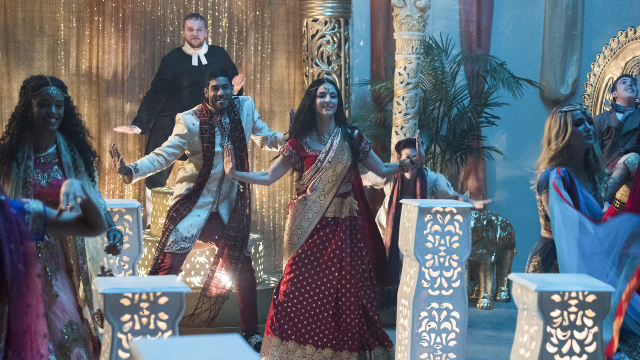 Under the effects of the love dust, Zari proposes that she and Kamadeva get married in full Bollywood style. Sara and Charlie try to stop Zari, but she dusts them, bringing them into her fantasy. It’s Mona, who is in control of her emotions, who is able to sing a song that breaks the dust’s hold over the team. Though they have lost at love at that moment, both Mona and Zari profess that when love come around again, they will be ready to surrender to it. Nate’s mother asks him to speak kindly of Hank, but Nate struggles to rectify the man those assembled think that Hank was and who Nate discovered him to be. Mick tells Nate that Hank’s gone, so anything that Nate says is for himself. Constantine, however, feels that Hank’s spirit is hanging around, which means it has something to say to Nate. Nate begins to speak his mind, but Hank’s haunting causes Nate to cut the speech short. Nate’s mother recalls the time that Hank dressed as Mickey Mouse and visited Nate and other kids in the hospital when Nate got sick, costing the family their Disney vacation. When the funeral ends, Nate finds a hidden room behind the bookshelf, where Hank’s plans become clear. Hank was training magical creatures in order to build a theme park–Heyworld–for people to interact with them, as a nine year old Nate once drew. 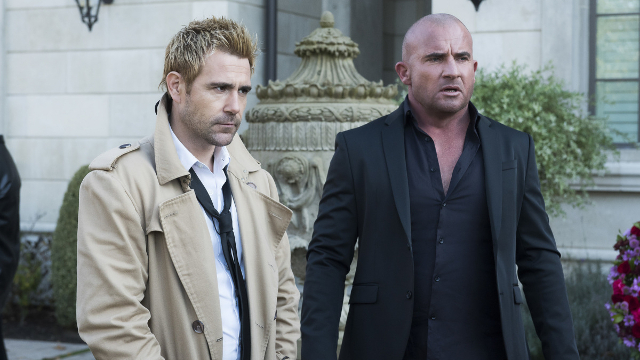 Constantine uses Mick as a vessel to summon Hank. Hank reveals that he was working with and killed by the demon Neron. Constantine deals with the news by getting drunk. He’s not strong enough to stop Neron, who taunts Constantine. Neron reveals that he has taken Des’s form, further unsettling Constantine. What did you think of Legends of Tomorrow season 4 episode 11? Let us know by posting a comment with your thoughts!